Pesto Tortellini Salad is the perfect pasta salad! 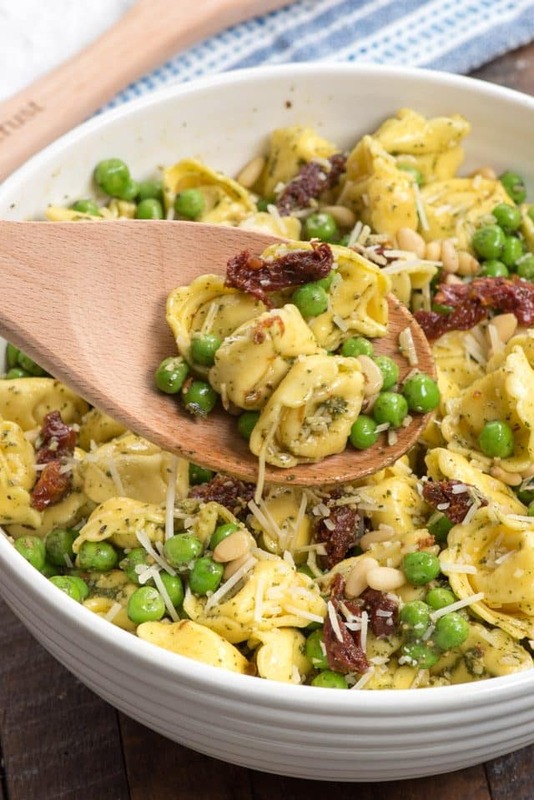 Filled with cheese tortellini and peas it’s coated with pesto and sun-dried tomatoes! Everyone always raves about this recipe! I think I could live on tortellini…especially with pesto! If you’re looking for a great last minute pasta salad recipe for a potluck, this is it. It only takes as long to make it as it does for the tortellini to cook! Regular pasta salads are great, but I love using tortellini. It adds a little something to the salad, some extra texture and flavor. Since I used cheese tortellini, this is also a good vegetarian option for guests at a party. Pasta salads aren’t just good for parties either; they stay good in the refrigerator for several days and only get better with age. I love having tortellini salad in the fridge and snacking on it for a few days. Most people use vinaigrette or dressing on pasta salad recipes but I love using pesto. Pesto is one of my absolute favorite flavors. Fresh basil is like a drug for me! I got one of those countertop LED gardens for Mother’s Day and I’m eagerly awaiting my basil crop. 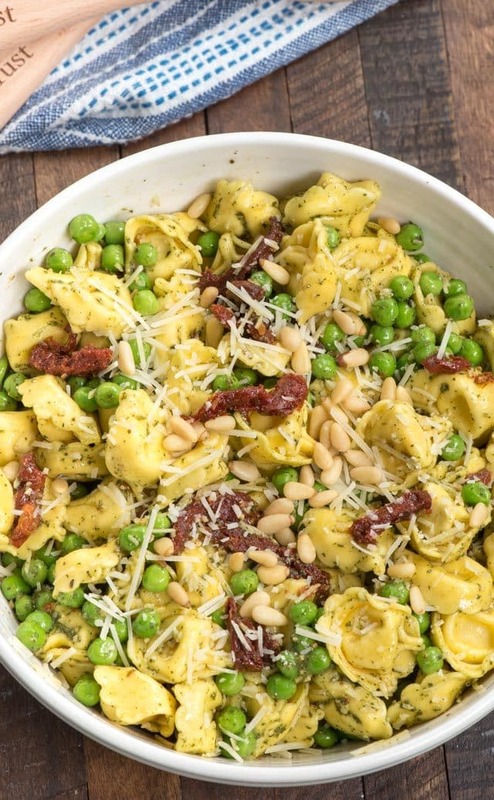 Tortellini salad made with pesto is perfect with peas and sun-dried tomatoes, parmesan cheese and pine nuts. It’s perfect for anytime you’re craving pesto or pasta! Pesto Tortellini Salad is an easy pasta salad recipe perfect for a potluck. 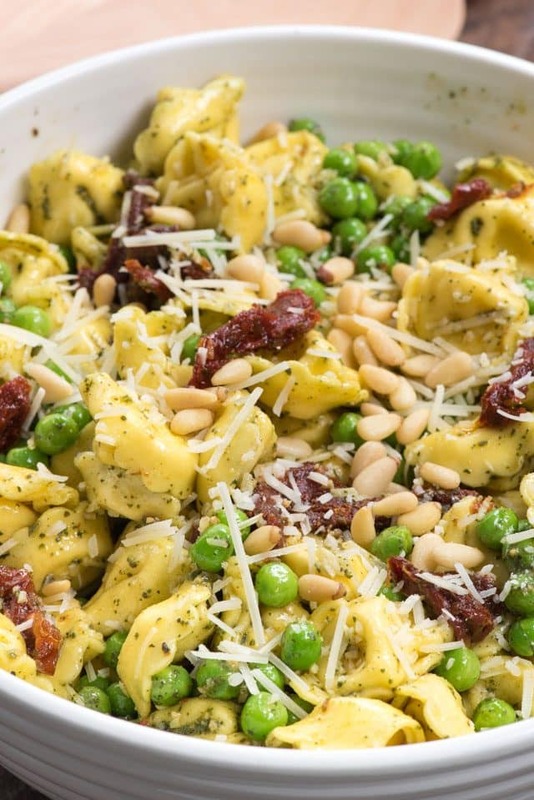 Filled with cheese tortellini, peas, and sun-dried tomatoes it’s coated with pesto for a flavorful bite! I’ve been making this recipe for years now and just recently decided I should photograph it for you. It’s one of the easiest pasta salad recipes you’ll ever make! What all goes in a tortellini salad with pesto? I use cheese tortellini, but you can use any flavor you like. I like to use frozen tortellini but you can use fresh if you prefer. Use fresh or prepared pesto. I love Classico (jarred) or Buitoni (fresh). Or you can make your own. If you like peas, I love adding frozen peas to the cooking water with the tortellini. They add nice color and flavor. Sun-dried tomatoes add another layer of flavor and texture to the salad. Pine nuts are expensive, but just a few go a long way in this salad. You can usually buy them in the bulk section or in the baking section with the baking nuts. Once the pasta cools from cooking you just assemble the salad. It gets better as it sits so you can eat it right away or make this ahead of time. Pesto Tortellini Salad is the perfect pasta salad! Filled with cheese tortellini and peas it's coated with pesto and sun-dried tomatoes! Everyone always raves about this recipe! Cook tortellini according to package directions. During the last 2 minutes of cooking time add the frozen peas to heat them up. Drain well. Toss with pesto. Let the past cool. Add sun-dried tomatoes, parmesan, and pine nuts. Toss and serve cold. Store in refrigerator. Good for up to 3 days. 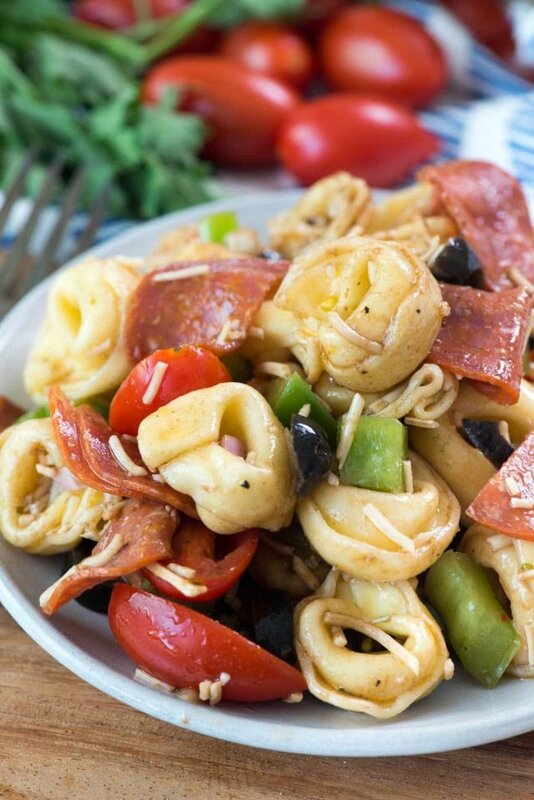 Another use for my favorite tortellini: Pizza Tortellini Salad, with all the flavors of pasta and pizza! 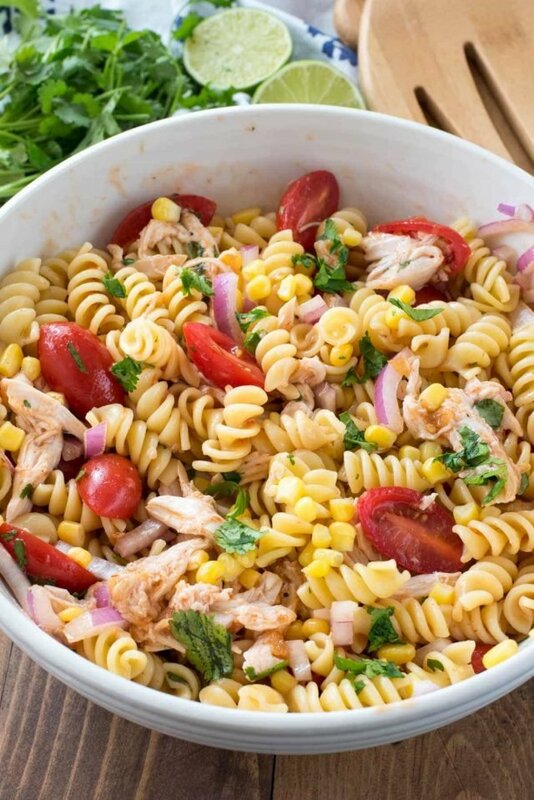 Mediterranean Chicken Pasta Salad is the perfect dinner because it packs tons of protein and flavor. 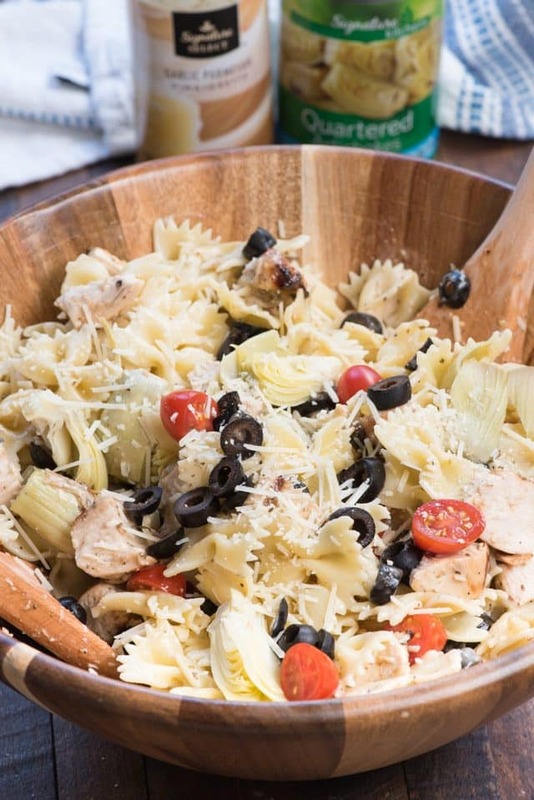 BBQ Chicken Pasta Salad combines all the flavors you’d see in a barbecue chicken salad but with pasta! I love that this is a last minute recipe! I feel like so many need time for the flavors to meld, so I like that this is boil and go!